Pave-Set Round Diamond Vintage Halo Engagement Ring | Shane Co.
Seventy-four round diamonds, at approximately .43 carat total weight, are pavé-set in quality 14 karat white gold creating this gorgeous halo engagement ring setting. The design is accented throughout by 14 karat rose gold and intricate vintage detailing. Your chosen center 1.00 carat diamond will be held in an enticing halo completely surrounded by milgrain detailing. 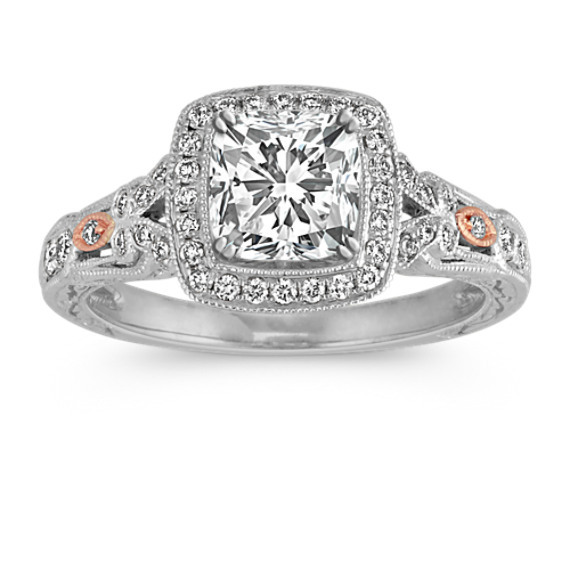 Popular center diamond shapes for this setting include cushion cut, round, and princess cut. Gemstone Carat Weight :.43 ct. t.w. I’ve been married 2.5 years and decided it was time to get my ring upgraded to finally have a diamond. Shopped around some and fell in love with this ring. It’s so gorgeous and unique. Haven’t found anything like it anywhere. And oh the sparkle! The staff was super friendly and helpful, even when we went back today to exchange the center stone because it wasn’t doing it for me.